We’ve been working really hard with our teacher, Miss Body. Have a look at this page to see what we’ve been up to. Remember to check back regularly. Well done all our classes who were above national attendance levels again this week – keep it up! This week we had joint winners – Well done Year 3 and Year 4! Last week we were really lucky to have a visit from Carl, who works for the Ministry of Chocolate (http://www.ministryofchocolate.com/). 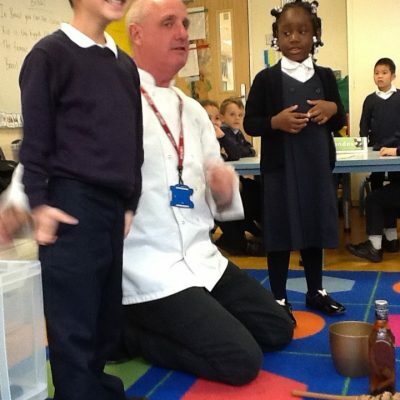 He came to teach us about where chocolate comes from and helped us make our own chocolates. Here are our Year 1 and 2 class making chocolate lollies. Congratulations to our Yellow team who earned the most points this week. Keep it up Yellow team! Last year we were really lucky to work with the local Charity YogaHome www.yogahome.com, who offered our Year 4 and 5 children Yoga classes. The children really enjoyed the classes and we often saw them practicing their moves in the playground the next day.